For expert assistance in choosing vinyl floor coverings for your home or business establishment, enlist the help of our design and flooring professionals. With extensive training in design and comprehensive brand knowledge, these professionals can answer all of your questions about vinyl flooring. Come into our local flooring showroom or ask us to come to you with samples. Vinyl is manufactured flooring that comes in sheets of 6’ and 12’. This flooring option has always been popular for home and business owners, but is even more so today. That is because flooring manufacturers are producing vinyl that is more beautiful, realistic, and resilient than ever before. Due to advanced manufacturing techniques, luxury vinyl tile and plank imitates ceramic tile and hardwood flooring down to the smallest details. Vinyl is also available in a host of handsome patterns and gorgeous colors. Resilient vinyl flooring is not only prized for its attractive appearance, but for its performance. This durable surface resists water, stains, scratches, and tears. Because of this, it is ideal for households where there are children and pets or for businesses that have customers coming and going constantly. No matter what the style, vinyl works well for busy people. You only need to sweep and damp mop when your floors require attention. Plus, vinyl flooring requires no maintenance. You can have the upscale style of ceramic, porcelain, and slate tile with flooring of another material. Many homeowners are selecting luxury vinyl tile for its ability to mimic tile. We offer brand-name LVT that gets is beauty from the embossing process. This results in vinyl flooring with the elegance of ceramic, the modern appearance of porcelain, and the stately beauty of slate tile. Hardwood flooring heightens the appeal of the grandest homes. You, too, can have the beauty of hardwood in your home with luxury vinyl plank. This style of flooring is manufactured to resemble wood planks down to the grain and knots. In addition to the handsome appearance of hardwood, vinyl flooring offers great versatility. Install this flooring everywhere – from the bathroom to the kitchen to the basement and more. Vinyl’s moisture-resistance allows for decorating possibilities you could not even consider with other types of flooring. 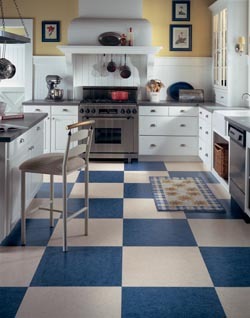 We have experts on staff for luxury vinyl tile installation. These professionals have the training and experience to install your flooring for beautiful appearance and high performance. We install vinyl over a surface that is clean, level, and dry, making sure that each piece adheres securely. This is the best way to prevent damage. If you should have any issues with your vinyl flooring, let us know. We take care of it promptly with no expense to you. Contact our flooring store to find out more about the styles and benefits of vinyl flooring. We offer a large selection of top brands of vinyl flooring for customers in Little Rock, Arkansas, and the surrounding areas.